The redesigned caps look like watch dials, inviting men to rewind the clock and refresh their skin. The rubber matte cap is functional and efficient, perfect for the on-the-go professional. The bottom is made from a sleek glossy material, evoking the aforementioned sports car, and the entire product is wrapped in a dark gray primary tone, which better embodies masculinity. I preserve Loreal's brand equity by integrating orange accents on the areas and typography, aligned with the hierarchy of read. Start from research to development it took us 14 weeks to finalize the redesign project. Loreal's mens packaging was feminine, nondescript, unfocused, and ineffective. 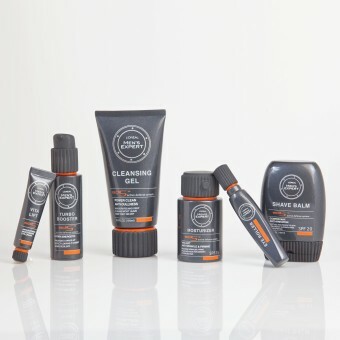 In redesigning its packaging, I sought to give it an assertive masculine brand identity, and was inspired by the design, meaning, and form of a sports car and man's watch. Loreal Men's Expert Skincare Series Mens Skincare Packaging Series by Eunice Young Tak is a Nominee in Packaging Design Category. 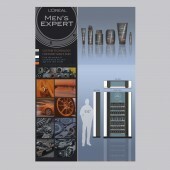 Loreal Men's Expert Skincare Series Mens Skincare Packaging Series by Eunice Young Tak is Winner in Packaging Design Category, 2011 - 2012. Did you like Eunice Young Tak's Packaging Design? 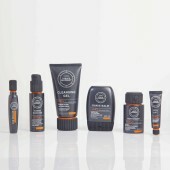 Did you like Loreal Men's Expert Skincare Series Mens Skincare Packaging Series? Help us create a global awareness for good packaging design worldwide. Show your support for Eunice Young Tak, the creator of great packaging design by gifting them a nomination ticket so that we could promote more of their great packaging designs.